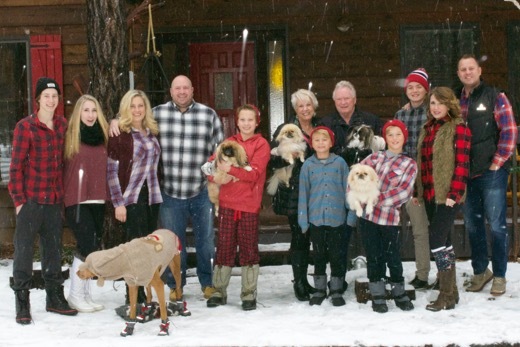 I Love this Christmas Family picture 2015 from The Craiks Family, who are Wonderful Parents to our Pekingese, Bella, Callie and Sophie over the Years, and their Big Beloved Doggie Penny. THANK YOU and Happy 2016 New Year. 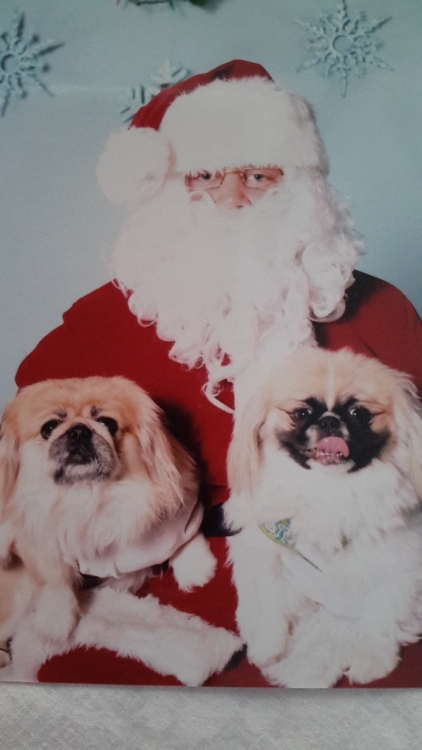 Thank You Sandi for the Adorable pictures of Chester and Charlie with Santa Claus! Honey, one of my Adults recently adopted, and now Loving her new home, and relaxing with her new daddy Herb. Tiny Tad at home playing with Emma, January 2015 which is his New mommy's Beautiful little Grand daughter. 8-23-2014 Here is Cooper with his big brother and girlfriend, now at 7 months old and not much bigger than he was as a baby, only 6lbs. Looks like he may be one of our Sleeves. No one can ever know for sure until they are at least this age or older. Pooh Bear with his new Mommy and Daddy, Carol and Art, at his Vet appointment getting his shots. They said he was a really good boy. 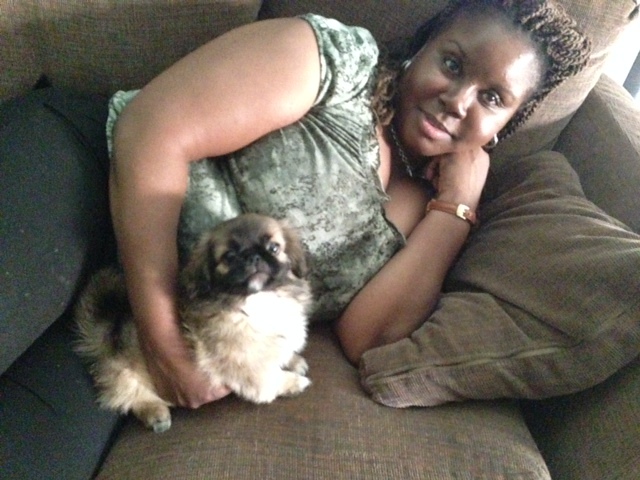 SNICKERS (previously Ricky Nelson) relaxing on the couch with his New Mommy Rochelle. 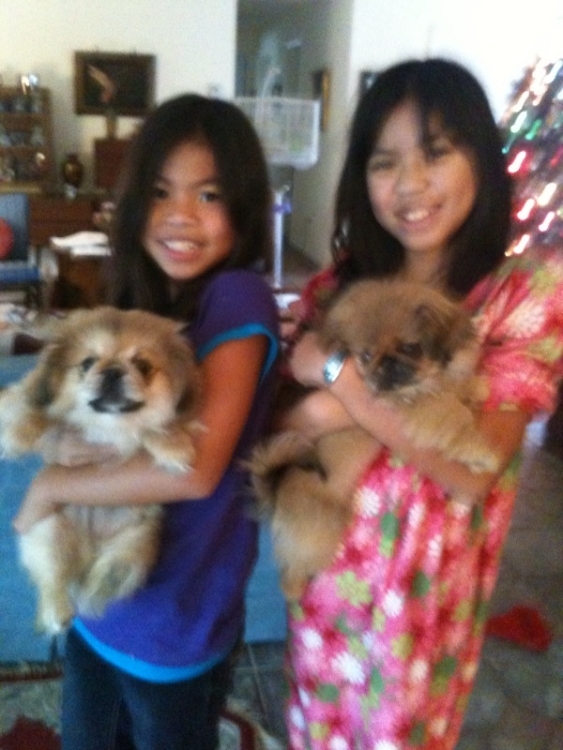 Snickers at home with his new family Rochelle, and Skylar. He is surely Loved. 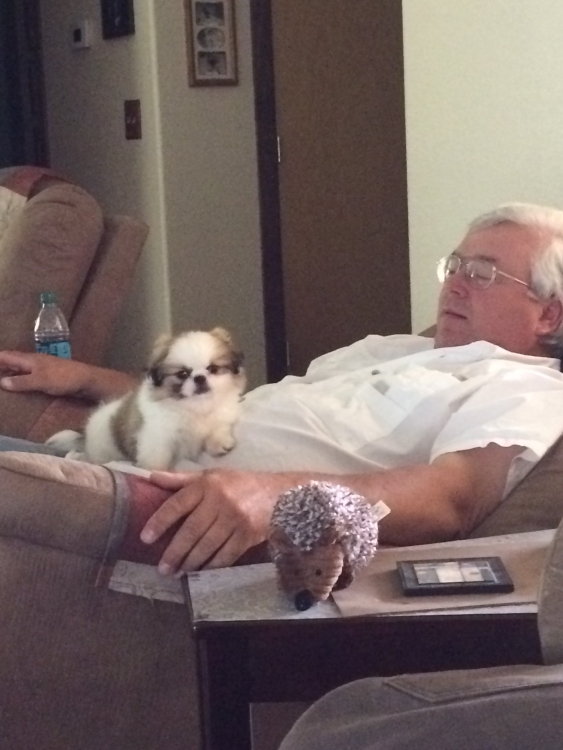 This is Pinky at home with her daddy Ron. 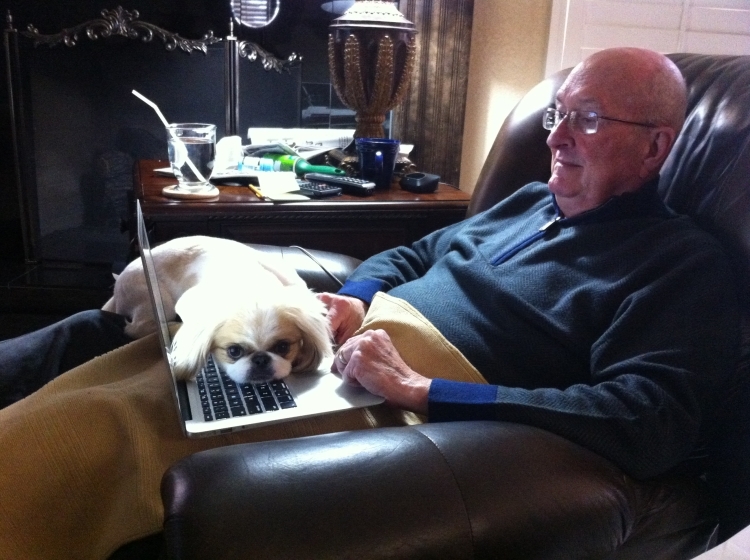 She wanted his undivided attention, so she laid across his laptop so he could'nt type LOL! How Precious! Cooper at home with his new Mommy Lori, 4-2014. He is one Happy Little Boy. 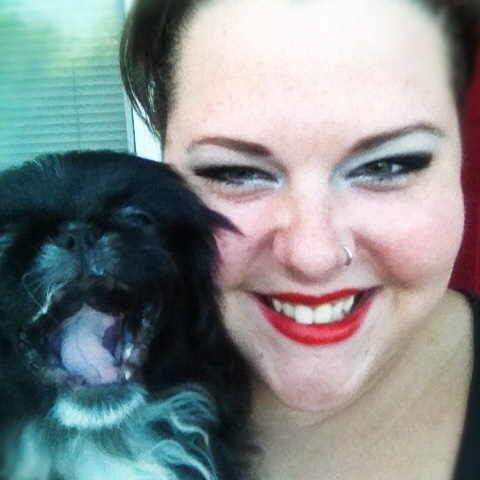 Delilah Hope with her New Mommy Tina who Loves her Dearly. 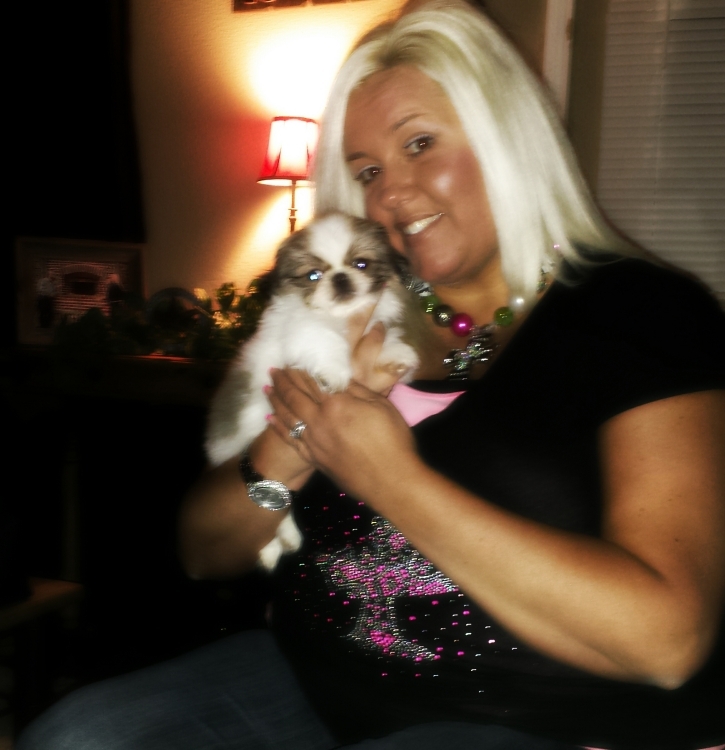 Truffles with her new mommy Tari. A Beautiful Family. 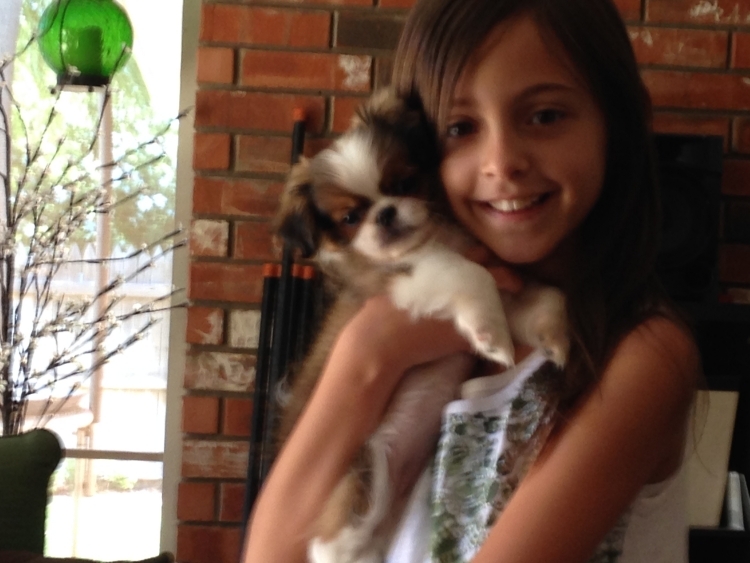 Princess is in her new home with her new Mommy JoAnn today in Escondido, California. The hardest thing Ever is saying goodbye. But the Best thing Ever is knowing she will have the most Wonderful Mom and Life. I Love You Princess. 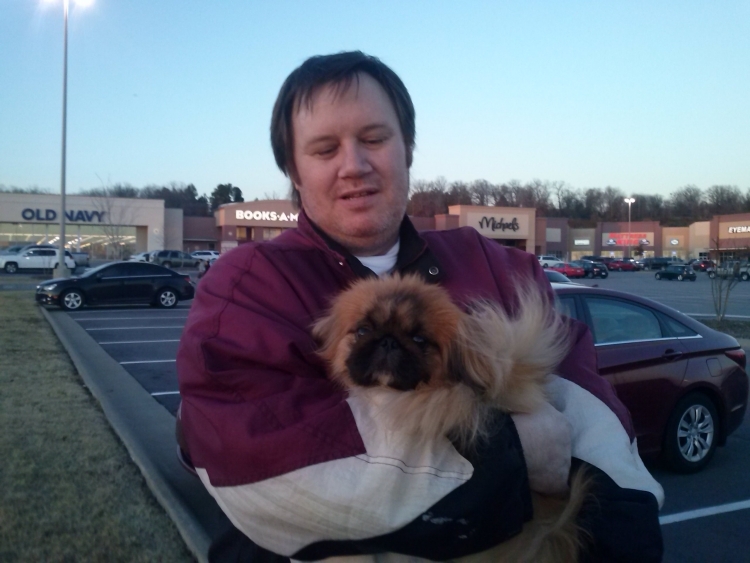 This is Prince Yum Yum with John today (2-17-2013) when we met him in person in Ft. Smith Arkansas. It was a very emotional day for us, and I had to hold back the tears, but meeting John and his friend made us know that Yum Yum would have the most Wonderful home with him. He plans to spoil Yum Yum and I am so Happy that he has such a great new Dad. We will miss him awful, but John said I can call to talk to Yum, and he will send many pictures. Of Course I will Post some here on "Your Page" We are back home tonight, and I want to say Goodnight Yum Yum...your little bed here is empty, and our hearts long for your sweet kisses, and Know that we will Always Love You so Much, but we are also Happy for you. 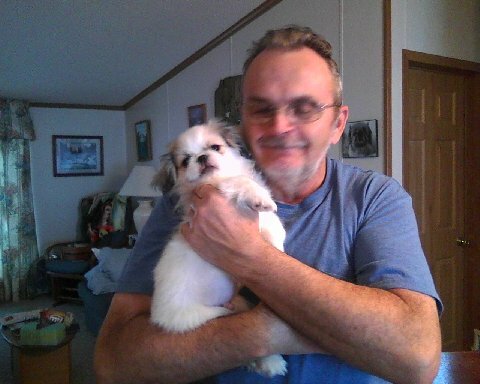 This is Scotty (previously Shine) with his New Daddy (Jan. 2013) As you can see, he is Dearly loved by his new family. 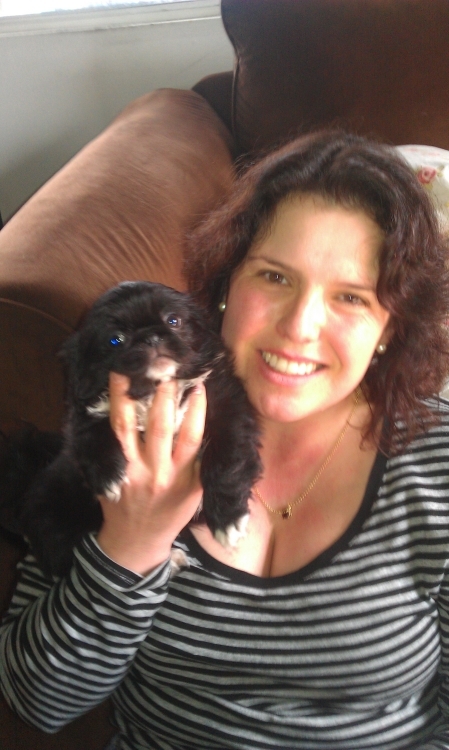 This is Merlin, his New name is Amici which means Friend in Italian :) with his new family Lisa and Dennis. He has a Wonderful and Loving new family as you can see. 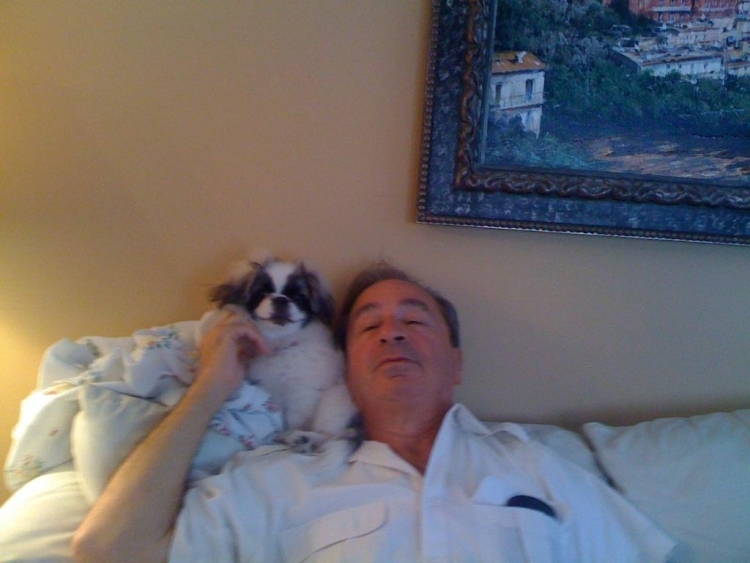 Macchia went Home to Mommy Reggie-Ann on 12-8-2012 and here are thier first pictures together for YOUR PAGE (12-14-2012) Aren't they both Just ADORABLE :) You can tell Macchia is Spoiled already? 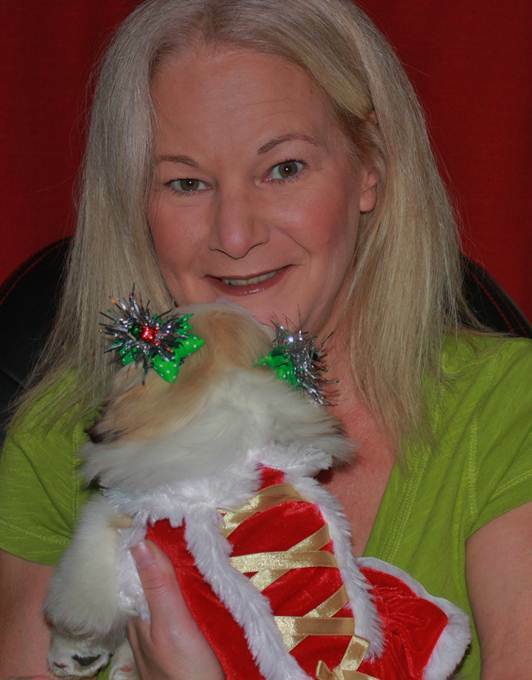 Macchia sporting her new Christmas dress that mommy Reggie-Ann bought her. Santa came early this year for Both of them. What better gift to yourself than a gift of Love. Cute New Picture of Melissa with Asia Lee (12-14-2012) Asia Lee is saying a Big Hello here! How Precious! Thank you Melissa for the Wonderful new pictures for YOUR PAGE. New Picture Dec. 14th. 2012 of Daddy Nathan with Asia Lee. Don't you think it's Just Adorable when daddy's really love thier tiny flat faced furry kids too. CLICK PICTURES TO ENLARGE. Remember Tiny Dragonfly? Well her new name is Bella and this is her Wonderful family Above. It is Obvious that she is Not Lacking for Lots of family to Love and who Love her! Including her new furry brother and play buddy Jersey, as you can see them playing tug-a-war. And her Elder Furry Family Member Zsa Zsa who actually looks like they are related. Bella with her Life Jacket on above on her 1st. boating trip with the family. Wow, I have to say that it is a Blessing to get the Wonderful Loving families we do for our Precious little babies. That is what it is all about. 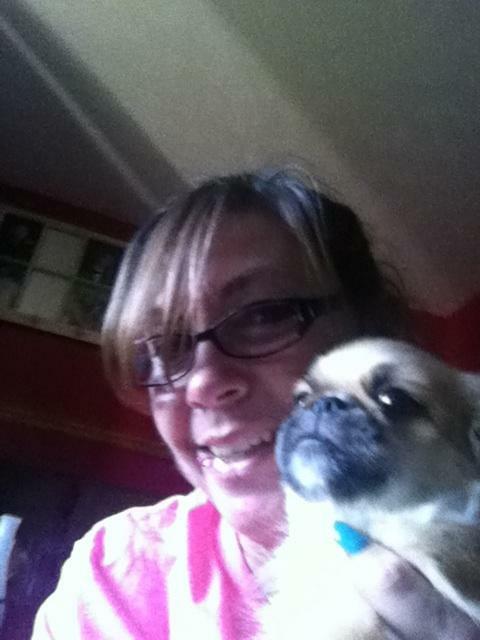 This is RALPHIE, (previously Poo Bear) with Mommy Stephanie. A Beautiful Match. 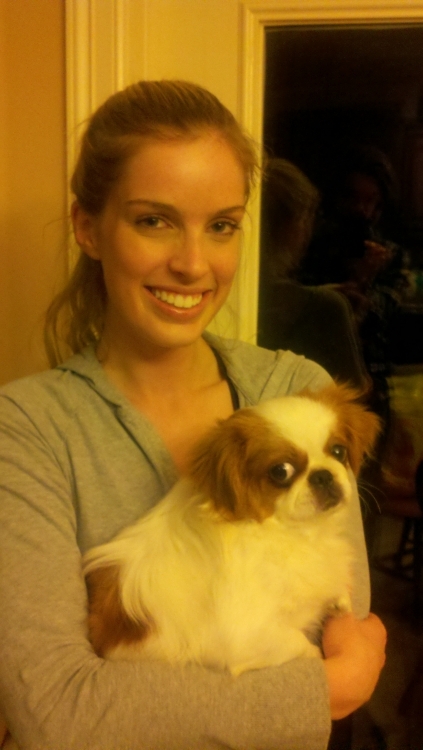 Here is Velvet with her new Mommy Mariana. It is True Love. 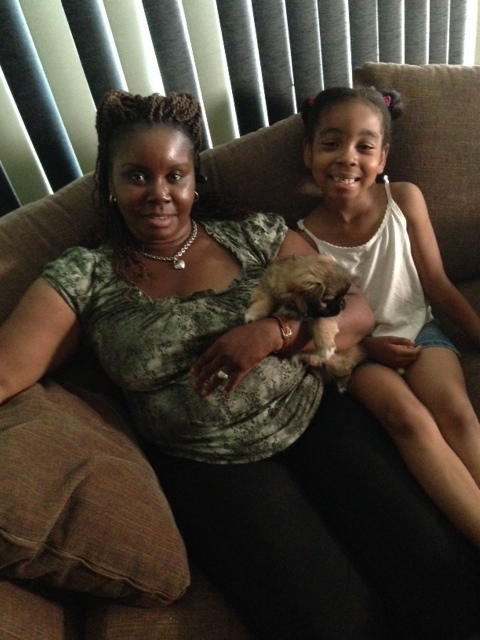 Here is Asia Lee with her New Mommy Melissa, June 29th. 2012. It is Love Forever After! Is there a Doubt in your Mind that Abby is Loved? 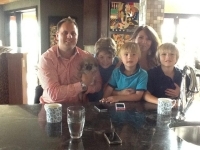 Here is Cambria with New Mom and Dad Tonya and Victor and thier Lovely Children. How nice it was to actually meet in person with these folks and thier children today "June 1st. 2012". 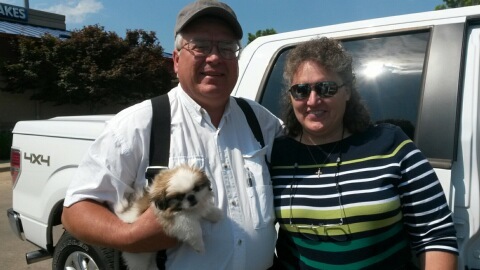 They drove a 10 hour + round trip from Tennessee to meet with us to pick up thier new puppy Cambria. She is a Special gift from Hubby to Wife. How Wonderful is that? :) Cambria cuddled right into Tonya's arms, and it appears she knows this is her new family to Love. YOU can Click on each picture to enlarge it. 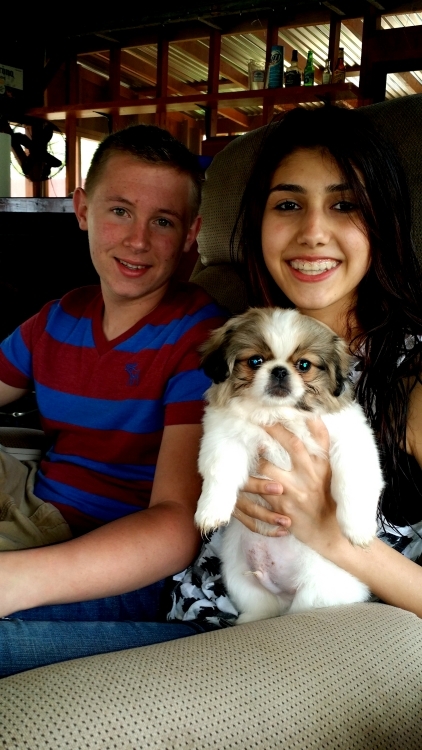 Snowy is Home with his New Family, Arrived Saturday, June 2nd. 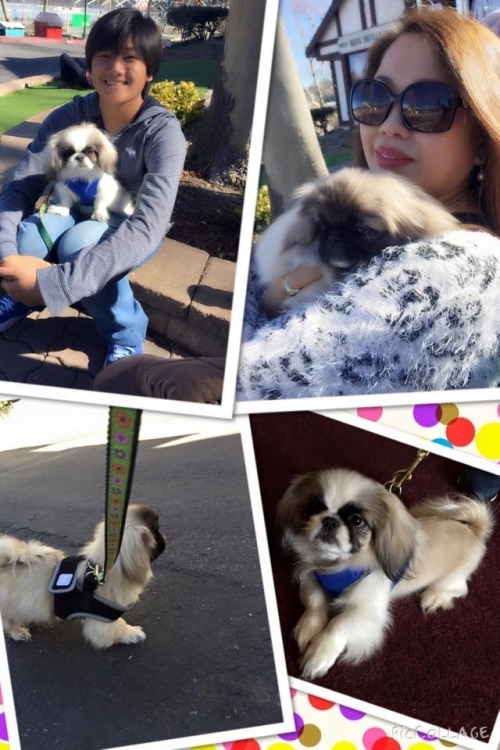 2012 on Continental Airlines Pet Safe Flight, and they sent me a Collage of Picture events from the time they picked him up at the airport until he was finally at home in his new bed. From Left to right, #1. daughter Allison carrying Snowy from the airport, #2. Son Kevin playing with Snowy in the car on way home, #3. Allison giving Snowy some special attention too, and he is Loving it, #4. 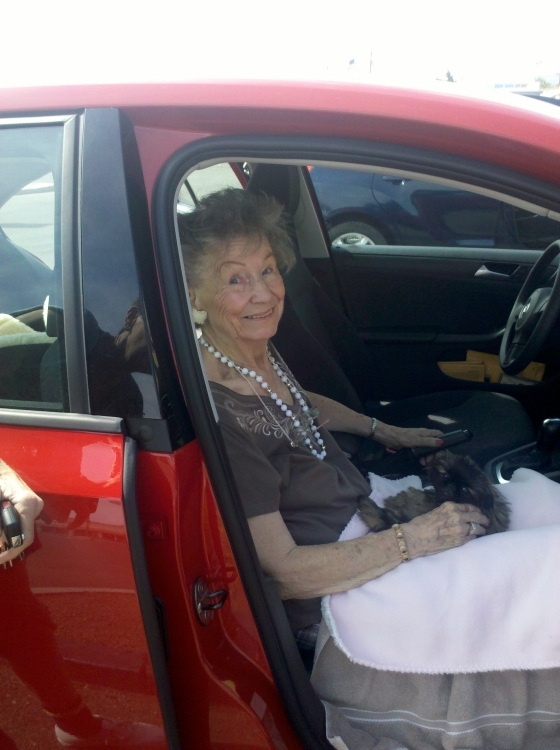 Mom June carrying Snowy into his new home, #5. Kids at home helping Snowy settle into his new environment, and #6. Snowy in his adorable new bed filled with everything he needs. He looks perfectly satisfied! 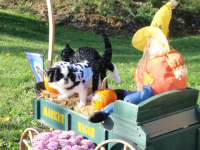 Hey Look, Snowy's Family just bought him a new Stroller and he Loves it! Thank You for being a Wonderful Loving Family for Snowy. 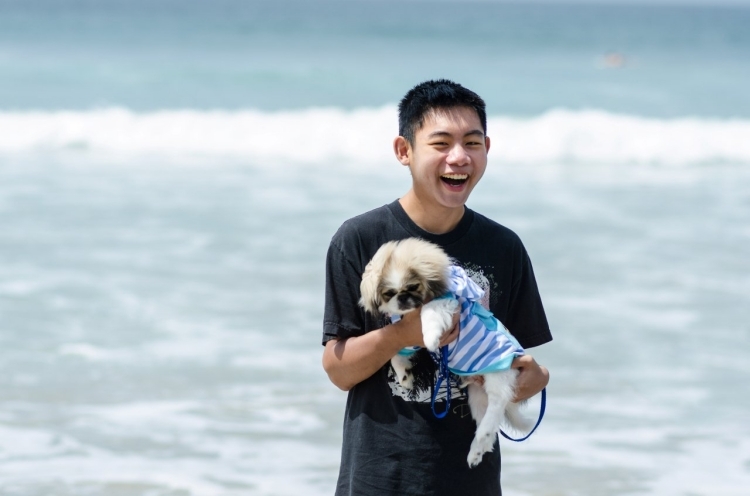 NEW Pictures of Snowy at the Beach with his Family in his new Beach Shirt too! Click on Thumbnail pictures to see fullsize. 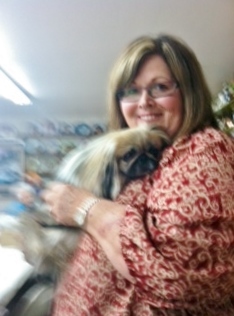 Joanne and her two Loving Pekingese. 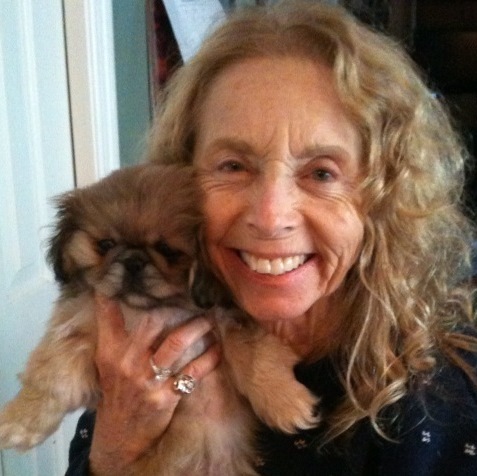 Velvet with her New mommy Mariana Jan. 2012 They are a Perfect Match with Lots of Love between them. 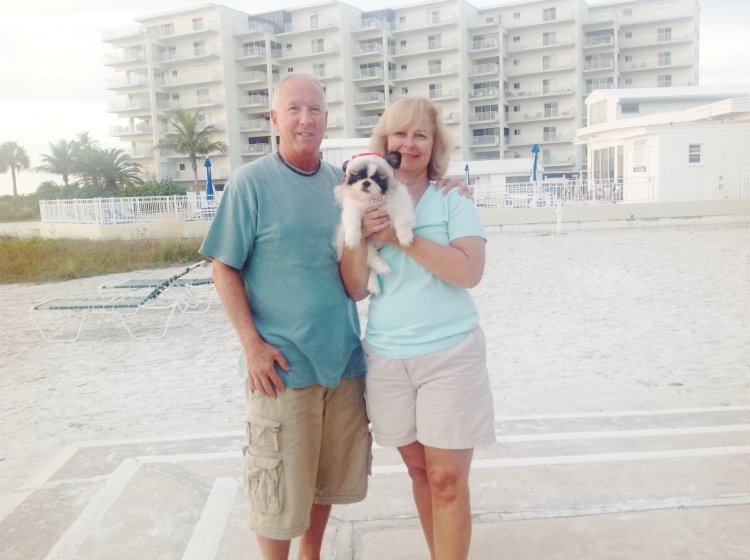 This is Jackson at home with his new daddy Dave and mommy Thelma in Florida. Jackson went home this Oct. and is being Spoiled Rotten. 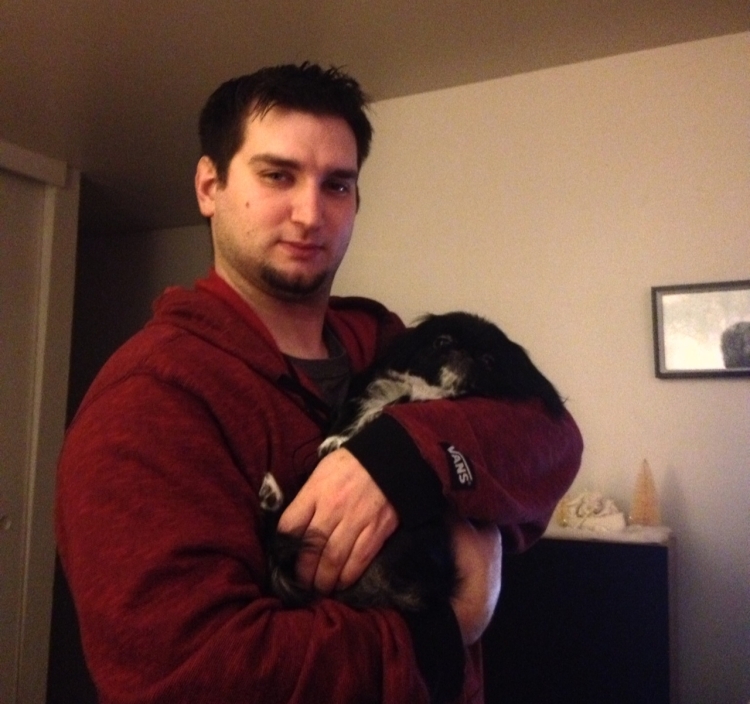 This is MOTO with his new loving parent XOUNG in Reno, Nevada. His friend Emily fell in love with Moto and she has just adopted Moto's brother BABY who will fly home to her this Saturday June 4th. How nice that Moto and Baby can grow up visiting eachother. 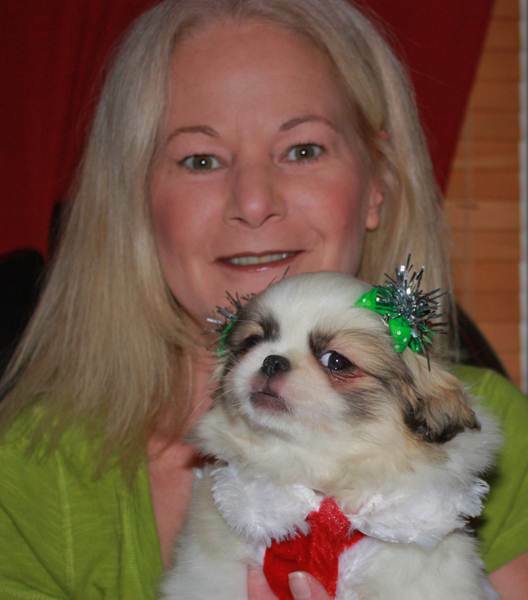 This is Wendy in FLorida with her new Peke/Shih Tzu Shinese puppy she adopted from us that we called Panda Bear, (he is the brother to Cocoa Bear now available, so go see his own page) but she and her husband Wiley renamed Panda "FBI". 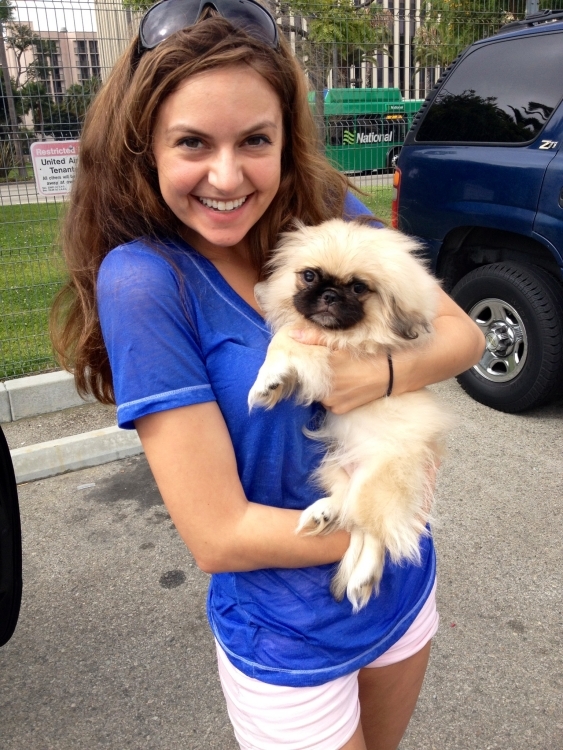 And they also recently adopted a little Peke from my family in CA. they call Clyde, in which they already had a puppy they named Bonnie! So now they have BONNIE & CLYDE and of course the FBI !!!!!!! TOO CUTE. Oh and they also have a darling little Bunny Rabbit too who they all play with!!! 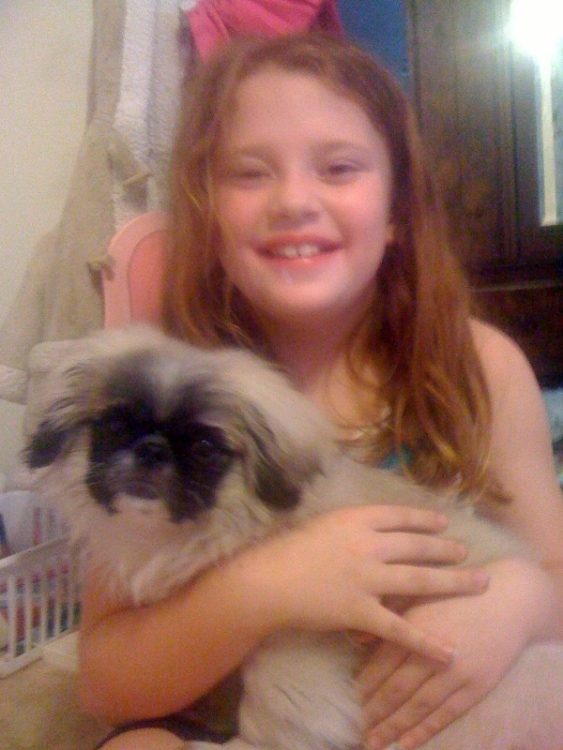 Here is little Peke ABBY with her Loving Family. 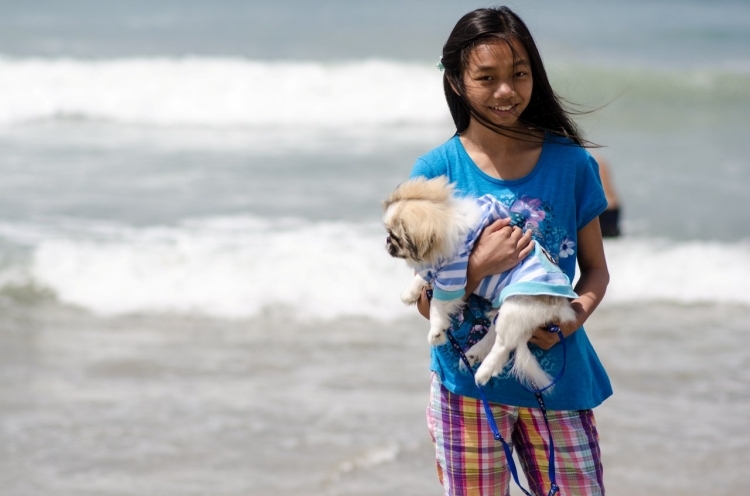 LiShen and Mei Mei just LOVE Thier new Family! Shipped together to their new home, they had a quite Cozy Flight, and into the arms of these Beautiful little Young ladies. Pebbles Cuddling in Bed with her Loving little momma who just couldn't wait to get her home. 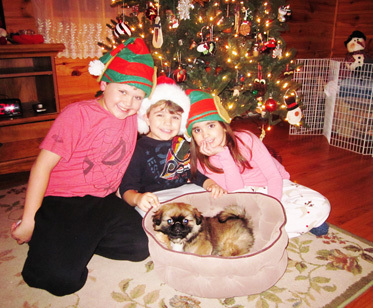 And here is Pebbles again with all her new Human Children to Love :) What a Fun Christmas! 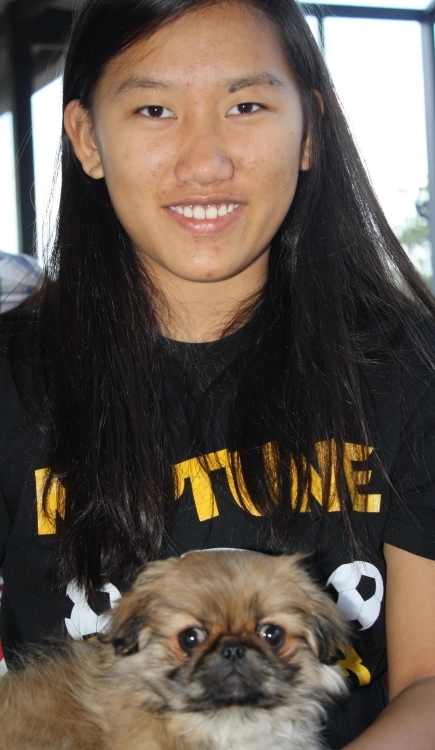 Here is Mei Ling Home with her New Loving Family. It is Everything I hope for to have my puppies loved and cared for. This is Tyrion in his new Mommy's Arms. They Love him Dearly. 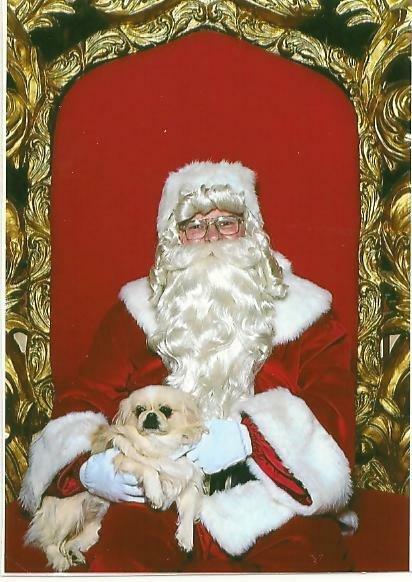 NEW PICTURE OF STAR YING WITH SANTA CLAUS DEC. 2010. THANK YOU GENNY. 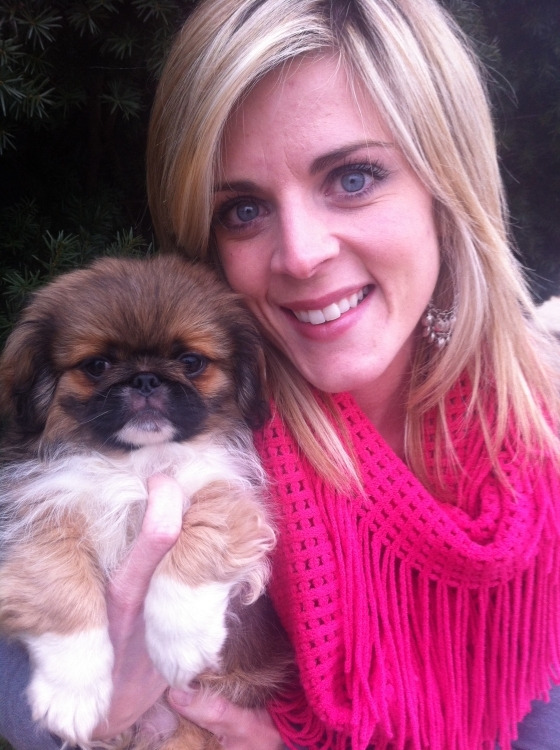 MARLO WITH HER NEW MOMMY JENNIFER, DEC. 2010 THANK YOU JENNIFER. PORKCHOP WITH HIS NEW FAMILY. HE'S A LUCKY BOY. THANK YOU. SNOW BEAR, ADOPTED BY LISA, IN BETHEL PARK, PA. She Loves Snow Bear and promised to send lots of great pictures soon. JAZZY GIRL, ADOPTED BY ANNIE, IN SAN RAFAEL, CALIFORNIA. Annie sent me Loads of Wonderful pictures so I created a Page Just for her and Jazzie. Go see it and all the Fun Pictures. I Love it! 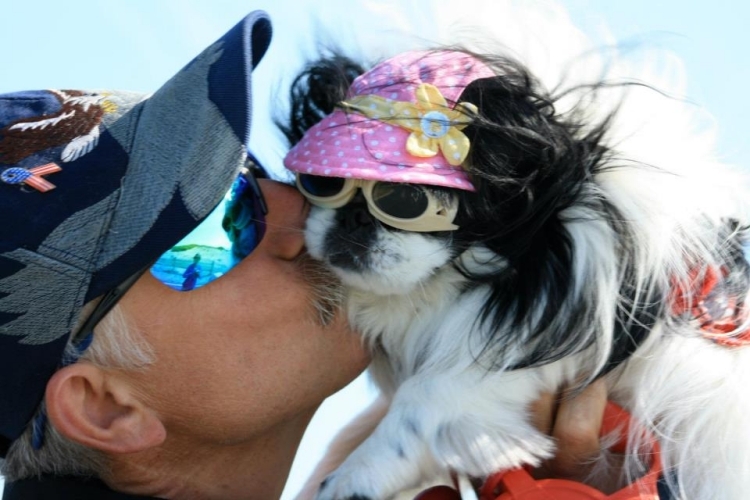 FLOWER CHILDREN, THIS IS MARBELLA, ADOPTED BY JACKIE IN MARYSVILLE, WA. 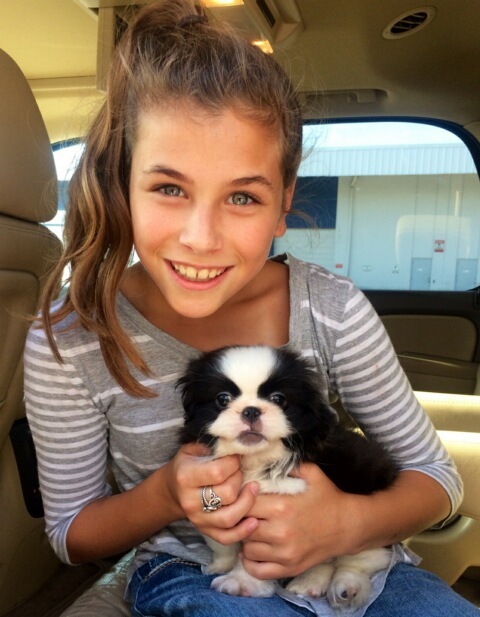 FLOWER CHILD LULU BELLE, ADOPTED BY JAY & PAIGE FOR THIER DAUGHTER ALLISON IN NEWPORT BEACH, CALIFORNIA. 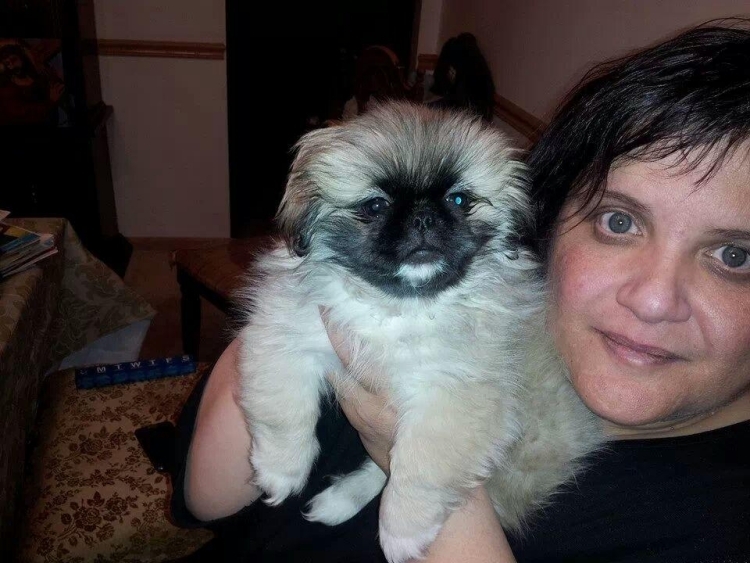 FLOWER CHILD GIDGET, ADOPTED BY MARIA IN MATAWAN, NEW JERSEY. POWDER, ADOPTED BY DIANE, IN STETTLER CANADA. DESIGNER, ADOPTED BY LINDA, IN ALBUQUERQUE, NEW MEXICO. Carolyn and Chubaka, who she calls "Chewy" for short. 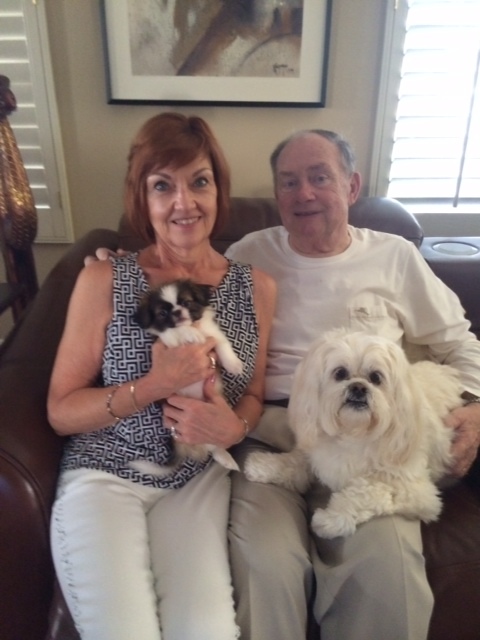 His mommy is Miss Milan and his daddy is our Little Tanner who are both now retired, although you can see them on our web pages. PekeaBoo Who is Now Renamed PETEY will be the NEW Baby in their Family :) We are looking forward to their pictures together soon to add to our Website. HI, I am Puffer's and I am a Beautiful little Toy boy. I HAVE BEEN ADOPTED BY VANESSA IN RENO, NEVADA. 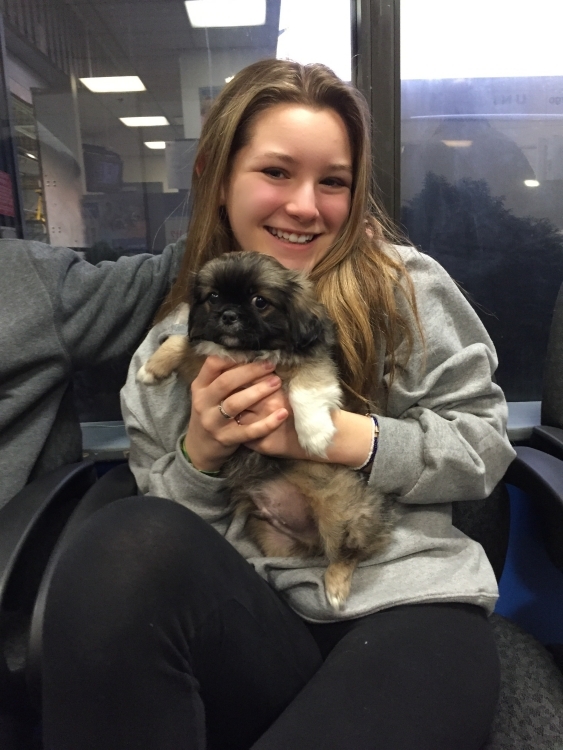 KARATE KID HAS BEEN ADOPTED BY SANDRA IN WARWICK NEW YORK AND WILL BE HOME IN TIME FOR VALENTINE'S DAY. This is SKY with his new Mom and Dad Chuck and Nita. We actually got to Meet them and hand them their new baby in Person, and that was a Great Treat. Wonderful Folks, and they Love Sky, and he is a Lucky boy to have such a Wonderful New Home with them. I AM SKIPPY and I am 10 WEEKS OLD, Full of Personality and playfulness, AND READY FOR ADOPTION. YOU CAN LOCK ME IN WITH A $200.00 DEPOSIT NOW. Beautiful Party Male with Lots of White, son of Blondie and Shrek. It looks like he may also have the White Mask, and he is a Beauty. Scotty is $795.00 with Free Shipping. tpekes4u@aol.com 909-754-6338 (more pictures available and new updated pictures weekly) ( Adopted by Regina in Oklahoma, Feb. 2011). Pictures of me with my new family coming soon. I am Tinker Toy (Adopted by Rhonda & Brandon in Burkburnette, Texas, Feb. 2011 ) Pictures of me with my new family coming soon. Hi Everybody, My name is POPPY and I am a Beautiful tiny Cream boy, (ADOPTED BY WENDY IN FLORIDA, Jan. 2011) Pictures of me with my new family coming soon.